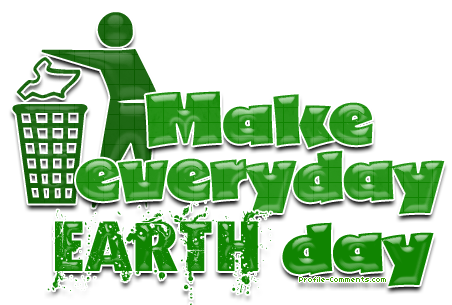 Earth Day, April 22, is meant to be a day to promote awareness about the environment and environmental activism, but seems to be composting itself down into the territory of many holidays as a single day to do activities we don't do the rest of the year. I propose that for Earth Day we look to New Year's Eve as the example holiday and use it as a day to make one or more resolutions to do for the next year instead of one activity for one day. All the holidays seem to be evolving from their roots as recognition for an event or remembrance into days to give cards (more and more e-cards and even just e-mails) and gifts, make time for family that you normally don't, and maybe do an activity for that day you don't do the rest of the year. Two examples: at Christmas we give gifts, along with the staple holidays get together with family, and may go to church the only time for the entire year; for Valentine's Day men give cards and gifts to their romantic partner, carve out time form their schedule to take them to a longer, nicer dinner, and for that day alone try to pay more attention to their partner and 'act' the gentleman. Earth Day - as it becomes bigger, more prominent, and more commercial - every year seems to devolve more and more into the American holiday model: we post messages and yes - even send cards, and take the time to do an activity just for the day such as doing a park, river, or highway cleanup. The only thing missing may be making time for family, although some of you may do your annual activity with family. In order to make this day - and any other day of recognition - more meaningful, one thing we can change or add into our activities is making them days of resolution. On each 'day', 'week' or 'month' seek to make a promise or resolution related to the meaning of that day. On Valentine's Day resolve to pay more attention to and treat your partner better every day. If you are religious take holidays such as current and upcoming Passover and Easter to resolve to put into practice the meaning and values of the holiday every day not just that day. On Memorial and Veteran's Day resolve to recognize and thank our soldiers and their families throughout the year in some way. If you don't get around to it this year - make your New Year's resolution to make holiday resolutions. You can even make your pledge at the Earth Day website. I already do pretty much everything listed above. This year my resolution is simply to increase those as close to 100% as I can - mainly in the area of personal hygiene. What Earth Day Resolution are you going to make? Comment below. And remember, when the next holiday comes along- Memorial Day is right around the corner - look for ways you can make a lasting resolution meaningful to the day's subject matter in addition to your annual one-time activities.